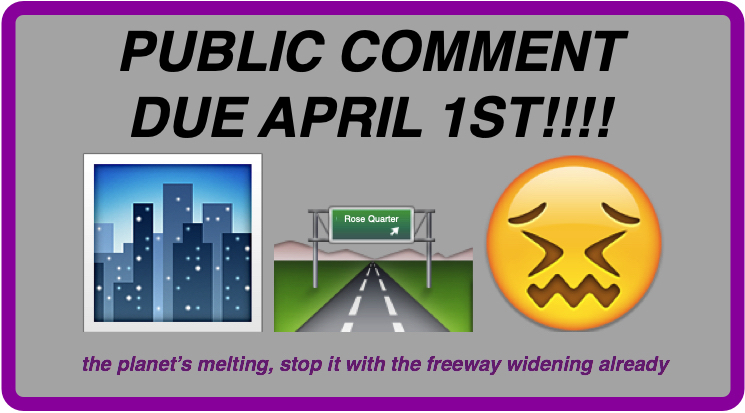 No Joke – Today’s the Deadline for Public Comment – No More Freeway Expansions. 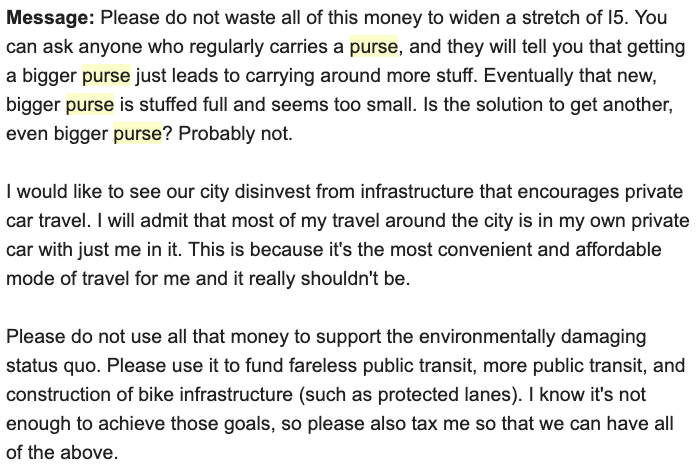 Click the above image to head straight to our public comment page. We’ve got a plenty long email below, but seriously. Speak now or forever hold your peace. If you wanna help with this campaign whatsoever, we need you on the record, and it closes tonight at 5pm. So go get ’em. Albina Vision Trust joins Portland Public Schools, members of the Harriet Tubman PTSA, The Street Trust, Oregon Walks, Portland Bus Lane Project, the Pacific Northwest Chapter of Safe Routes to School, the City’s Pedestrian and Bicycle Advisory Committees, AORTA, Oregon Environmental Council, Oregon League of Conservation Voters, Center for Sustainable Economy, Portland Audubon Society, 350 PDX, Sierra Club’s Oregon Chapter, OPAL – Environmental Justice Oregon, Neighbors for Clean Air the Eliot Neighborhood Association, and Irvington Community Association (among others) with letters on the public record explicitly asking ODOT to scrap their Environmental Assessment and conduct a more thorough Environmental Impact Statement that adequately addresses the public health, air pollution, transportation needs, traffic safety, and carbon emission concerns our campaign has been shouting about for the past month and a half. Approximately 600+ comments have been submitted from individual community members opposing this project. Opposition to this campaign dominated this month’s public hearing, and with ODOT finally getting around to giving us some additional data and schematics, we’re finding all sorts of other glaring deficiencies with the design, including that it will encroach significantly on the Vera Katz Eastbank Esplanade. Today we’re submitting a legal document written with the assistance of some lawyers that highlights every single ODOT misstep in the NEPA process, and we’ve already submitted two years worth of newspaper clippings, dozens of academic articles on air pollution, and all of our letters of advocacy over the past few years. Now, all that’s missing is you. Want to stop this freeway? We need to get you on the record before 5pm today. 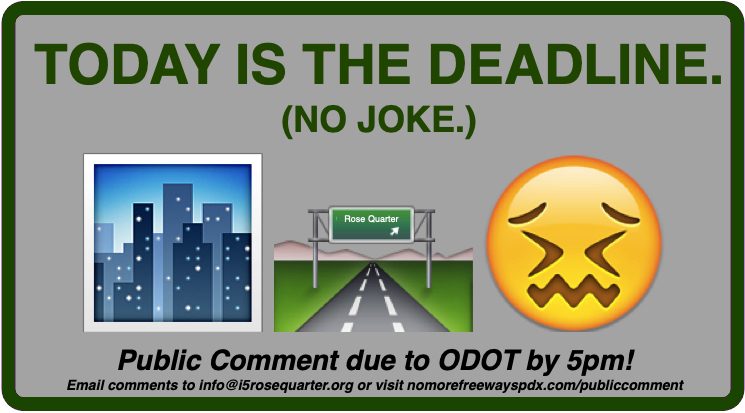 Submit Public Comment in Opposition to the Rose Quarter Freeway Expansion and demand an EIS. Click on the icon to the right to submit testimony, and help spread the word by posting the link on social media. 40% of Oregon’s carbon emissions come from transportation – it’s the only sector of Oregon’s economy where carbon emissions are growing instead of shrinking. 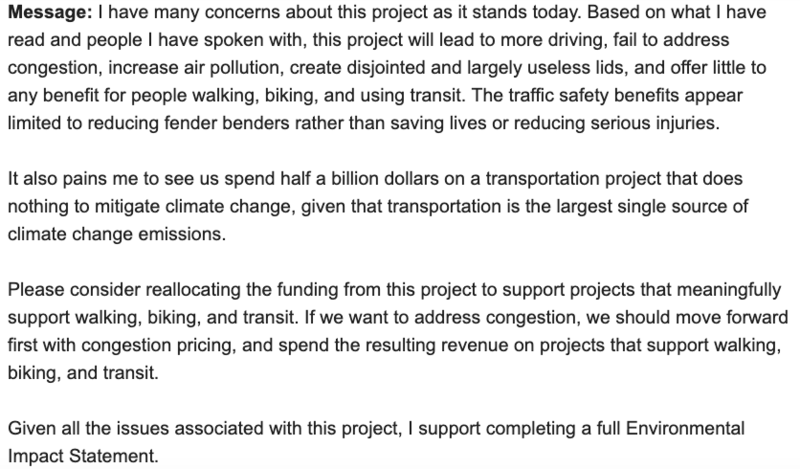 Every available climate report the state has produced has stated that Oregon simply must rely less on the private automobile, particularly inside the Portland Metro region, for daily transportation needs if we have a chance of meeting our ambitious and necessary goals of reducing carbon emissions. Considering we only have 11 years to stave off the most cataclysmic impacts of climate change, that seems like a big deal! We fully believe in the whole “shine the light you wish to see in the world” trope, so this Saturday night, we partnered with the fine folks of PEST to put a little message on the front walls of ODOT’s downtown office to remind them that their proposed actions are diametrically opposed to any sane, rational approach to addressing the urgency that the climate crisis represents to current and future generations. Thanks to PEST for joining us, and thanks to KGW News for covering us as the lead in to Saturday Night Live this weekend!